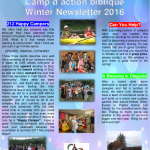 Read our 2016 Winter Newsletter. We often hear our campers say that although they have attended other camps in the past, they prefer coming to CAB. What is it that keeps them wanting to come back? With a growing number of campers each year, we realize that additional housing for some of our staff is becoming a pressing need. Find out how a violent wind storm that destroyed our canvas canopies and fell a number of trees turned into a true blessing!